This extremely attractive and elegant apartment building was erected in 1914 and converted to a cooperative in 1946. Its beige brick facade is very finely detailed and has a great top with woven patterning and very nice wrought-iron balconies as well a handsome decorative balcony on the top floor. The 12-story building, which replaced eight row houses on the sidestreet, was designed by George and Edward Blum. 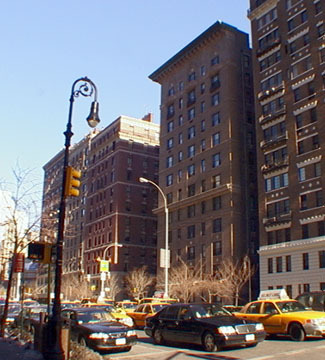 The Blums designed many other Park Avenue apartment buildings including 791, 830, 940 and 1075. 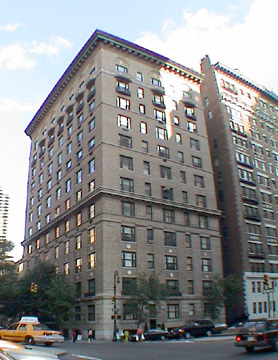 Over the years, this building has had many prominent residents including television personality Barbara Walters, music publisher Rudolph Schirmer, and Paine Webber chief executive officer Donald B. Marron Jr. The building, which has a sidestreet entrance, has 25 apartments, a canopied entrance and a doorman but no garage, no health club and no sundeck. This section of Park Avenue is very desirable because it has several very handsome low-rise buildings and churches that make it architecturally quite interesting. It is also very close to midtown and convenient to many fashionable boutiques and restaurants along Madison Avenue and is not too far from Central Park.